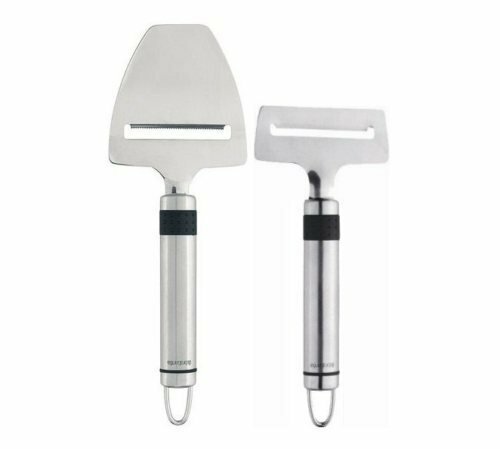 Brabantia Profile Stainless Steel Cheese Slicer - 2pc Set Designed in The Netherlands! Right from the start, back in 1919, Brabantia has put all available knowledge, expertise and experience into developing solid reliable products that can last a lifetime. Today everything from their selection of raw materials to the design of the packaging must result in the attitude and core value of Brabantia durability. Brabantia's ambition is simple, to develop household products that retain their beauty and performance for up to the next 20 years. Its what drives the company, its who they are. Brabantia's Profile Collection is a professional range of kitchen utensils. It provides the perfect tool for every type of cook. An excellent choice for those who enjoy their cooking, from preparing a special 'Haute Cuisine' dish or just a daily home made meal. No more danger of slicing more than the cheese! The Profile soft cheese slicer is problem-free to use because of its smooth sprung steel and ground knife. The short blade makes it extra handy for slicing soft cheese and the cheese doesn't stick to the slicer! It's even suitable for other food products like cucumbers and carrots. The Profile traditional cheese slicer is problem-free to use because of its smooth sprung steel and ground knife. It's even suitable for other food products like cucumber and carrots. This slicer features a Micro-Serrated blade that slices evenly though cheese without sticking. The serrated blade also imparts a rippled texture to the cheese to enhance it's taste and presentation! Traditional Cheese Slicer: Length 8 1/4" Width 3"
Soft Cheese Slicer: Length 6 1/2" Width 3"